The other thing that takes us back into time is the speed of the ride; or rather, the lack of it. In fact, we have seldom come across a driver less in a hurry. Though we normally want our buses to go slowly and carefully, ever fearful of accidents, even we think that this guy could speed up a bit. Most of the journey is fairly boring, even though we see lots more camels, but the final stretch is spectacular. 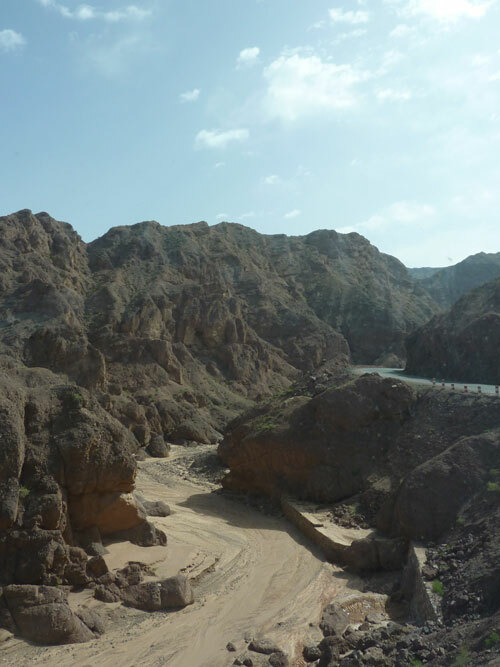 We are following a river and driving through a canyon of dark-red rocks, eroded into fantastic shapes. We can see several signs pointing towards ‘Scenic Areas’ and a couple of fake, concrete hotel-yurts. This must be another new area being developed for tourism. If we had had our own wheels, it might have been worth a stop. 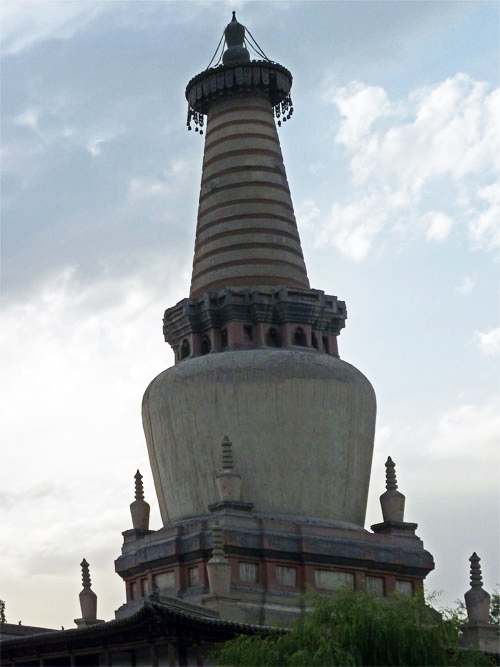 Almost as soon as we come out of this amazing scenery, we find ourselves in the bustle of downtown Zhangye, close to the statue of Marco Polo and some broad avenues of mock Venetian architecture. 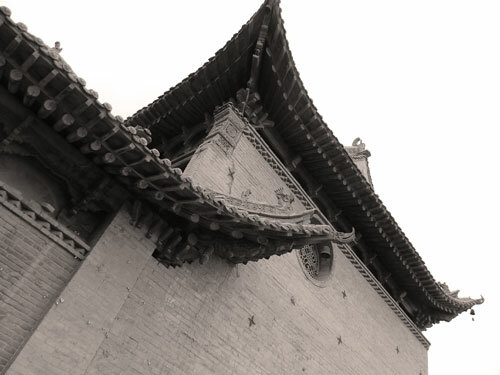 Of course, one of Zhangye’s claims to fame is that the legendary traveller Marco Polo purportedly spent one year here, in the days when the city was known by its Tangut name Campichu. We flag down a taxi and go in search of a hotel. From the car window we can see many modern, bustling, often tree-lined streets, full of shops and small businesses. There seem to be plenty of hotels as well, some of them very posh. Once we’re settled in the hotel of our choice, the Ganzhou, we dedicate the afternoon and evening to exploring the city. 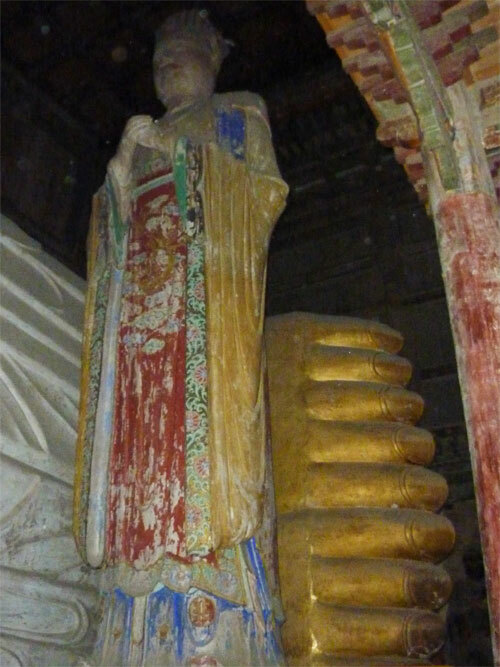 Zhangye’s number one sight is the colossal, 35- metre, lying Buddha in the Dafo Temple, which was originally built in 1098 during the Western Xia Dynasty (Xi Xia). 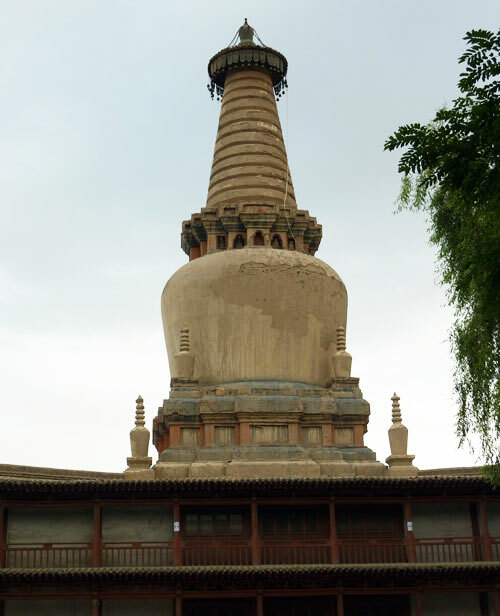 Despite having seen so many Buddha statues, this impressive relic from the heyday of the Silk Road still manages to send the shivers up our spines. 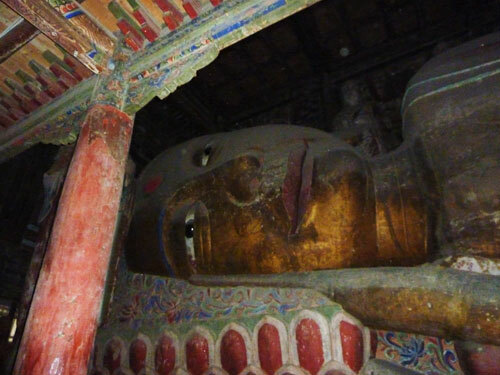 Like the first time we saw the famous Buddhas in Dunhuang, more than 20 years ago, we feel transported back to another era. 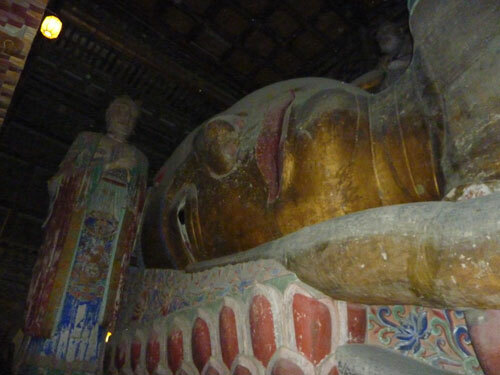 The Buddha is stretched out on his side, sleeping peacefully, with a serene expression on his face. 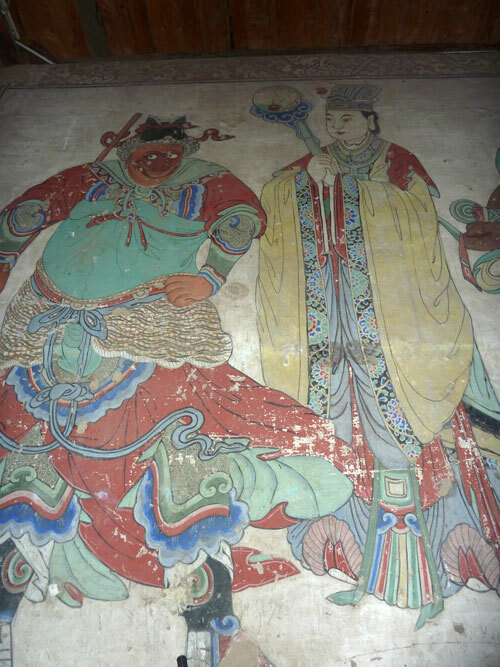 He is guarded by a row of ancient, crumbling arhats, and set against a backdrop of fading murals that are hard to make out in the semi-darkness. 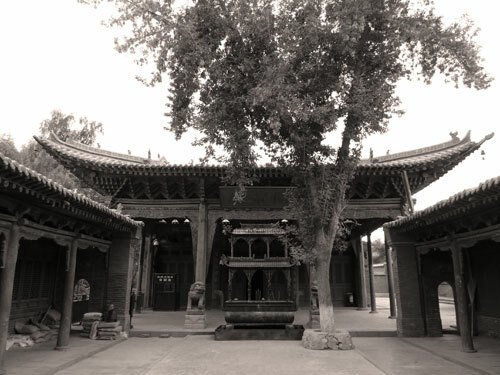 The handsome wooden hall that houses the Buddha is said to be one of the few surviving wooden structures from its epoch. Apart from the Buddha, there are plenty of other things to see. 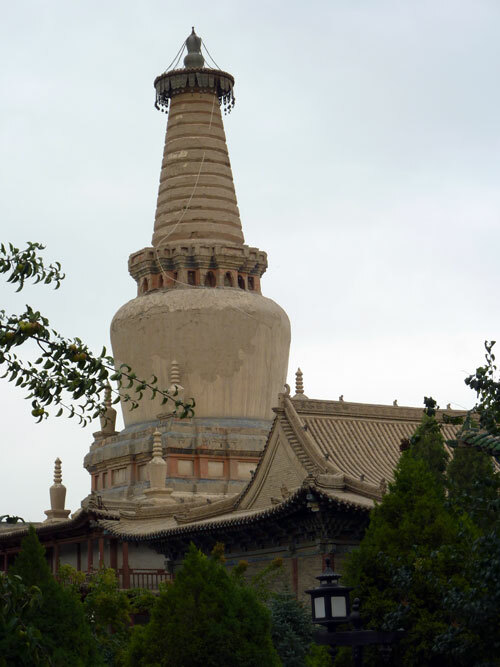 The temple grounds are huge and contain several exhibition halls, an impressive white stupa, and a gorgeous, very well preserved, Qing dynasty Guildhall with fine eaves, decorated arches, a stage and a temple hall. After our visit, we walk all around the temple complex, through the atmospheric, old-style Qing streets that take you back to the China of old. There are many little eateries, some with boiling cauldrons of intestines and offal, as well as shops, including several butcher’s, many souvenir stalls and all kinds of religious paraphernalia. 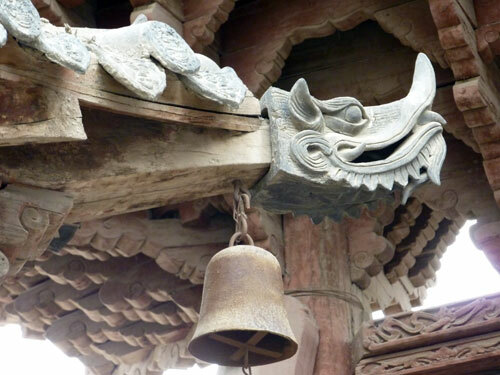 Photo opportunities abound, such as good views of the white stupa from different angles, or the beautifully carved and painted outer doors of the Guildhall. 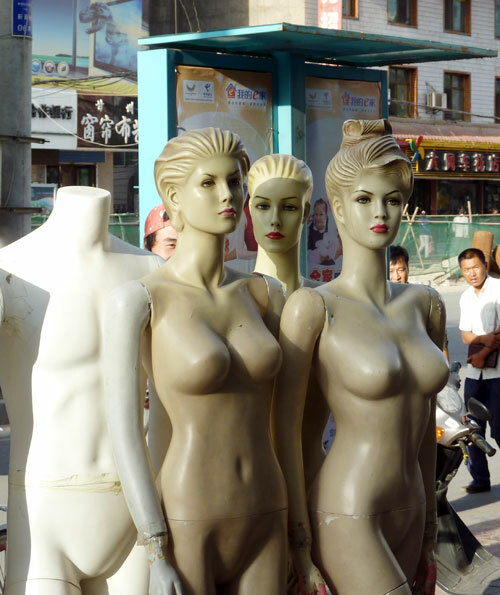 Zhangye’s modern, central square is just across the road and buzzing with life. 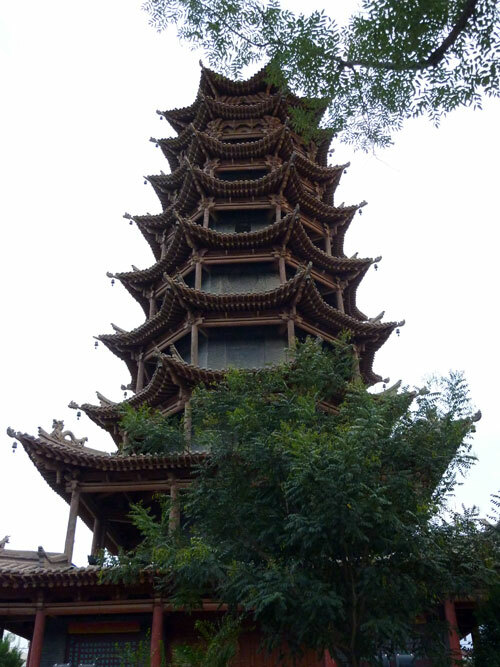 Its centrepiece is a tall pagoda which you can climb. 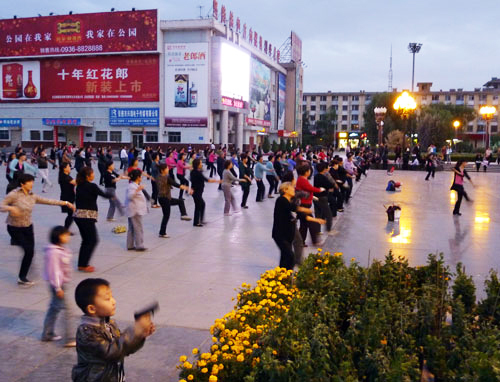 But much more interesting than the pagoda are the local people who flock to the square in the early evening. 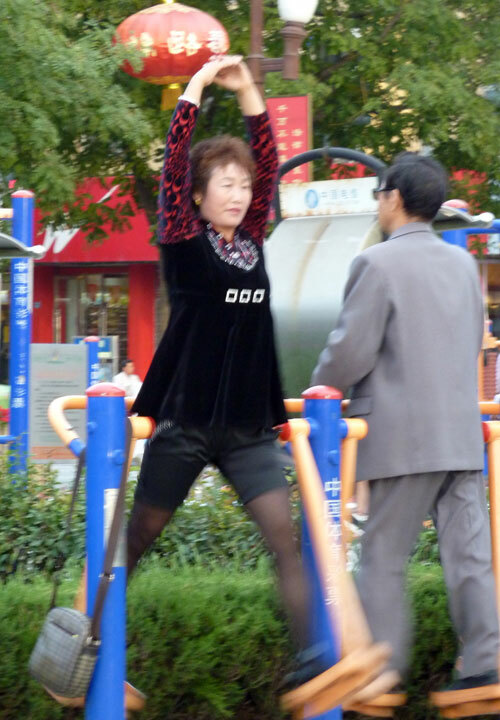 We marvel at the incredible feats some locals are performing on the outdoor exercise machines, like the lean old man, presumably a practitioner of Tai qi, contorting and stretching his back; or the middle-aged woman, vigorously swinging her legs on a kind of Stepper, without using her hands to hold on. Other people are strumming traditional string instruments, singing Chinese opera tunes, playing with yo-yos, or flying kites. When night falls, the dancers come out: a large group of, mostly elderly, women who try to follow the moves of two young, slim girls in black and pink track suits, with very little success. What’s so great is that no-one seems even the slightest bit self-conscious about doing these things in public; a very Chinese trait and probably a very healthy one. Once we’ve explored the sights, it’s time for dinner. 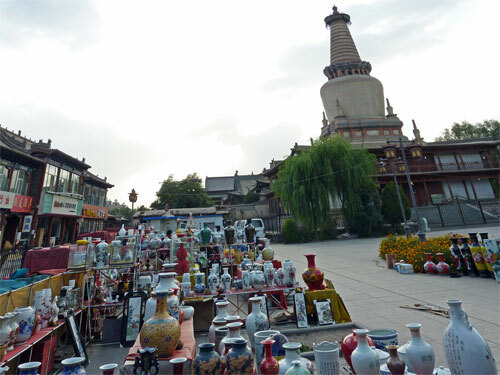 Another great thing about Zhangye is that you won’t go hungry, as restaurants and food markets abound. You can eat ‘al fresco’ on a kind of food square: a terrace surrounded by dozens of small restaurants and stalls; just order your food from any of the restaurants and eat it on the terrace, washed down with a cold beer. 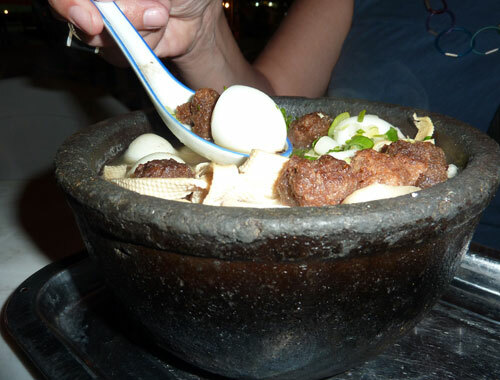 Food choices include Chinese burgers, boiled pigs snout and trotters, meat and vegetable skewers, or tasty soups called Shaguo砂锅; these are clay pots filled with a variety of ingredients heated up over a fiery flame. There are even some vegetarian Shaguo options, though I doubt if the stock is meat free. 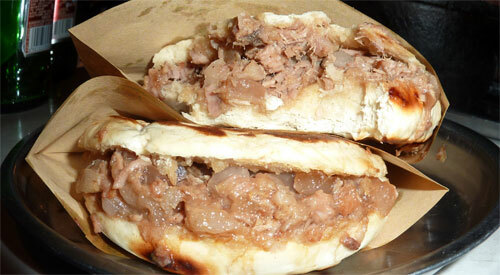 Another popular snack are Rou Bings肉饼, the closest you get to an authentic Chinese hamburger. 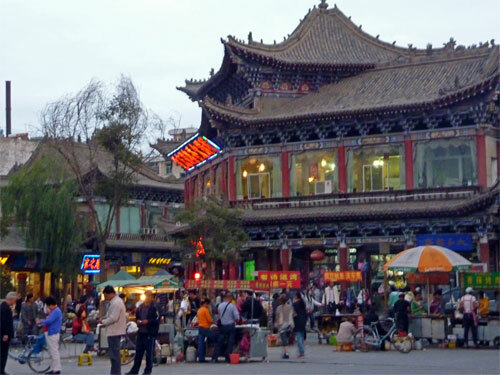 Or, if you prefer a sit-down meal, you can head over to the fake-Qing food street: a pedestrianized street of semi-traditional buildings, most of which house restaurants, though there are some antiques and souvenir shops as well. 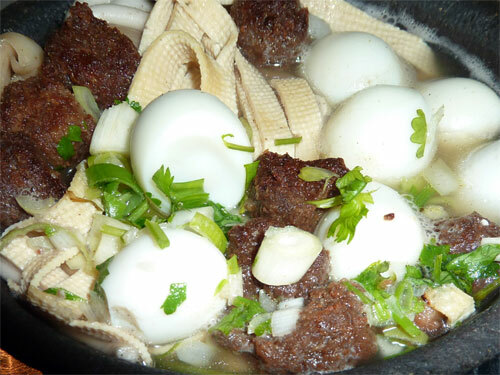 The restaurants serve up a wide range of cuisines/ dishes such as Sichuan, Xinjiang and Zhejiang and there are quite a few hot pot places as well. Should you get thirsty, there are a number of beer terraces at the far end of the street. The Dafo / Great Buddha Temple: tickets cost a curious 41 Yuan and the temple halls remain open until 18:00 (not 18:30 as stated in the Lonely Planet), though we were allowed to walk the grounds for a bit longer. The Pagoda on the main square remained open until mid to late evening and didn’t close at 18:00 as the Lonely Planet had it. We got to Zhangye by bus from Alashan Youqi. There are two daily departures, one at 8.30 and the other at 15.00. The journey takes about 3 hours. Times are similar from Zhangye to Alashan Youqi ( for the Badain Jaran Desert) . We left Zhangye by train, on a soft-seat night train to Lanzhou, leaving at 01:24 at night and arriving at around 7.00 am. There were many other departures to Lanzhou throughout the day and night but unfortunately these were the only tickets we could get. 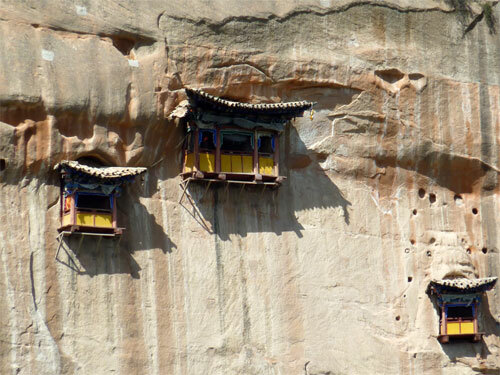 There are also trains going to Dunhuang and Jiayuguan as well as on into Xinjiang and Ürumqi. 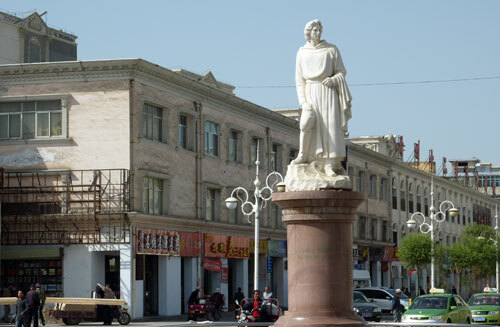 There is a convenient Railway Ticket booking office in the centre of town, near the Marco Polo statue. Hard Sleeper tickets seemed hard to get here. There are day and night buses to Lanzhou and regular departures for Wuwei. 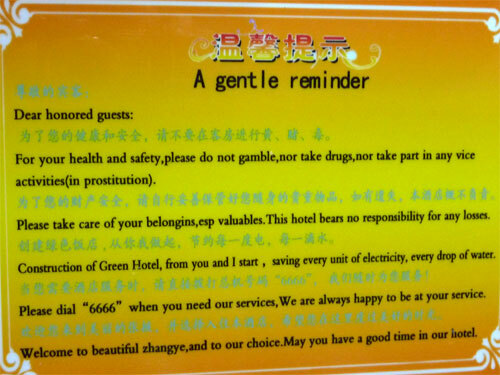 We stayed at the Ganzhou hotel. The hotel is set back from the main street on a courtyard and large, comfortable double rooms go for 168 Yuan, including breakfast and internet connection. Before choosing this hotel, we inspected several others, including the Lonely Planet recommended Xinyuan Binguan, which was pretty worn out, but cheap at 120 Yuan a double. Other places we saw were much plusher … and much more upmarket. 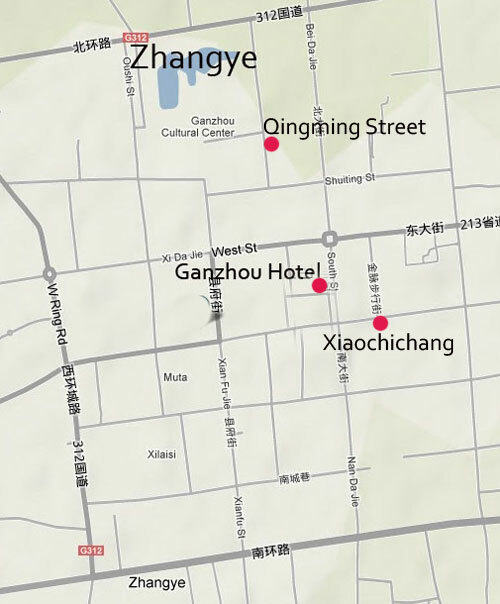 There are plenty of restaurants in Zhangye. However, if you are staying just a few days it is probably best to visit the restored Qing Ming Street with its buzzing eateries. Spicy Sichuan cooking is popular here. There ‘s a great atmoshere of revelry in all the restaurants. 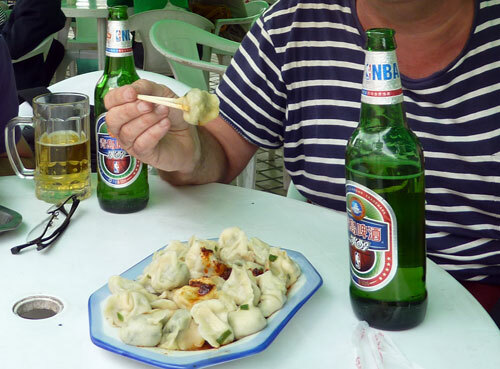 In summer the Xiaochichang (Little Eat Market) is well worth a try. 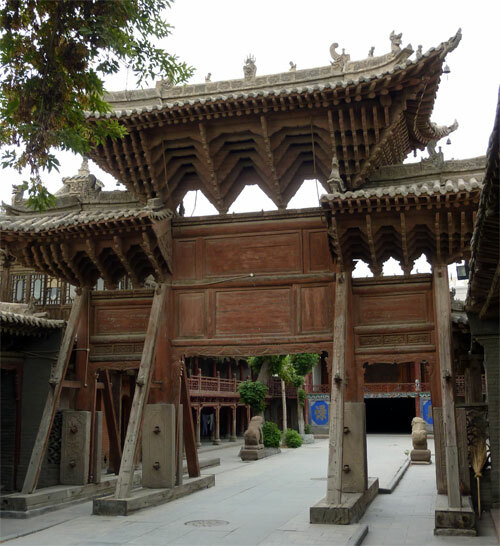 Use the central Zhangye Gate to get your bearings. 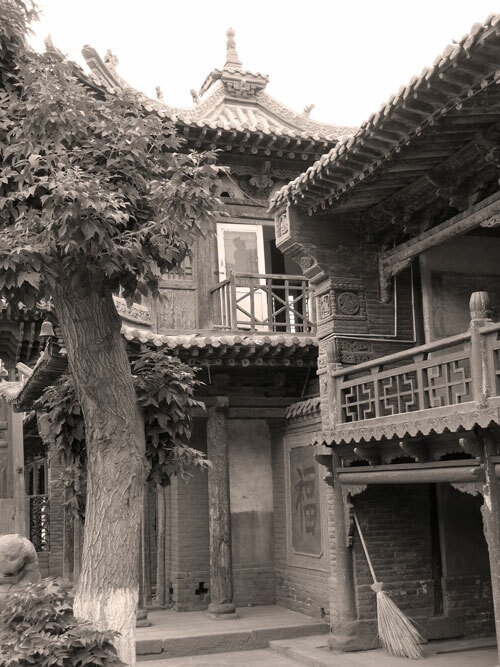 For Qing ming Street, head down Xida jie and turn right into a street with restored Qing era buildings. For the Xiaochichang head down Nandajie one block and turn right; the market is about 200 meters down on the right. 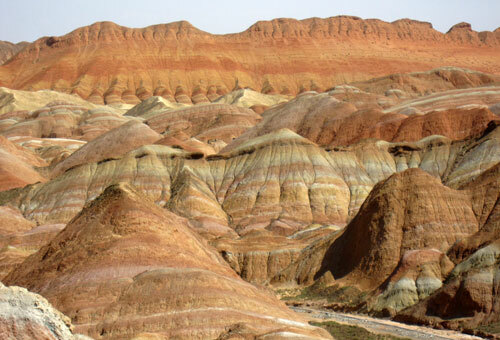 Other compelling reasons for visiting Zhangye are the city’s location and surroundings. Zhangye is situated in the narrowest part of the once strategic Hexi Corridor, which formed an important stretch of the Silk Road. 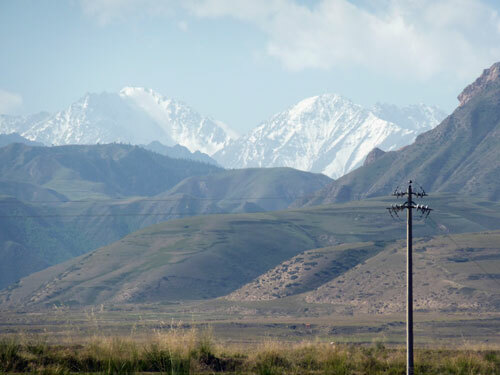 On the one side, the city is hemmed in by the towering Qian lian mountain range, whose mysterious, snowcapped peaks form an impregnable barrier, while on the other side the Gobi Desert stretches for miles and miles. Whoever controlled this area, controlled access in and out of China. 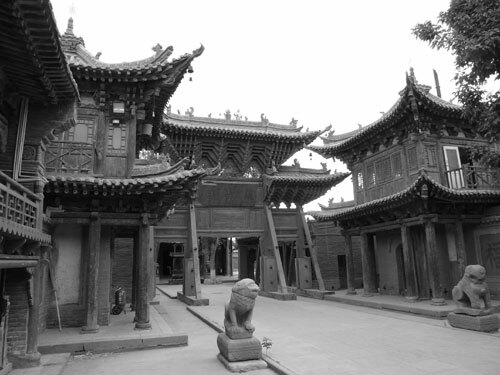 Even the nomadic Mongols found it necessary to set up a permanent garrison town here, Heicheng ( not to be confused with the more famous Heicheng or Khara-Kota in Inner Mongolia), whose ruins you can visit on the outskirts of town. OMG, its so beautiful. The color of the figures are so vivid still and so beautiful. We used a Lonely Planet guide as well. 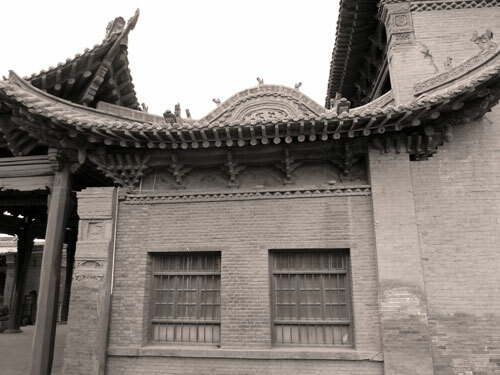 The Friendship hotel in Lanzhou is no longer there, its been demolished, I think they are going to build something else there. We wished we had more time, that’s our usual lament.